Not to be confused with the Philippine Basketball Association team that played under the "FedEx Express" name, now known as the Barako Bull Energy Cola. FedEx Express, formerly Federal Express, is a cargo airline based in Memphis, Tennessee, United States. It is the world's largest airline in terms of freight tons flown and the world's ninth largest in terms of fleet size. It is a subsidiary of FedEx Corporation, delivering packages and freight to more than 375 destinations in nearly every country each day. Its headquarters are in Memphis with its global "SuperHub" located at Memphis International Airport. In the United States, FedEx Express has a national hub at Indianapolis International Airport. Regional hubs are located at Ted Stevens Anchorage International Airport, Oakland International Airport, Newark Liberty International Airport, Fort Worth Alliance Airport, Piedmont Triad International Airport, and Miami International Airport. International regional hubs are located at Paris-Charles de Gaulle Airport, Guangzhou Baiyun International Airport, Kansai International Airport, Toronto Pearson International Airport, and Cologne Bonn Airport. There are a total of 12 air hubs in the company's worldwide network. 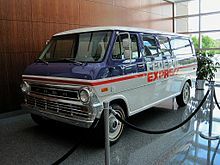 The concept for what became Federal Express came to Fred Smith in the mid-1960s, while an undergraduate student at Yale. For an economics class, he submitted a paper which argued that in modern technological society time meant money more than ever before and with the advent of miniaturized electronic circuitry, very small components had become extremely valuable. He argued that the consumer society was becoming increasingly hungry for mass-produced electronic items, but the decentralizing effect induced by these very devices gave manufacturers tremendous logistic problems in delivering the items. Smith felt that the necessary delivery speed could only be achieved by using air transport. But he believed that the U.S. air cargo system was so inflexible and bound by regulations at that time that it was completely incapable of making sufficiently fast deliveries. Plus, the U.S. air cargo industry was highly unsuited to the role. Its system depended on cooperation between companies, as interlining was often necessary to get a consignment from point A to point B, and the industry relied heavily on cargo forwarders to fill hold space and perform doorstep deliveries. In his paper, Smith proposed a new concept—have one carrier be responsible for a piece of cargo from local pick-up right through to ultimate delivery, operating its own aircraft, depots, posting stations, and delivery vans. To ensure accurate sorting and dispatching of every item of freight, the carrier would fly it from all of its pickup stations to a central clearinghouse, from where the entire operation would be controlled. For years it has been misreported that the professor teaching the course gave the paper the grade of "C", but Fred clarified in a 2004 interview that the grade is not known and the reports of a "C" grade were due to his response to a reporter who asked him what grade he received and his reply was, "I don't know, probably made my usual C." Despite the professor's opinion, Smith held on to the idea. Smith founded Federal Express Corporation in 1971 in Little Rock, Arkansas, where Smith was operating Little Rock Airmotive. After a lack of support from the Little Rock National Airport, Smith moved the company to Memphis, Tennessee and Memphis International Airport in 1973. The company started overnight operations on April 17, 1973, with fourteen Dassault Falcon 20s that connected twenty-five cities in the United States. Fred Smith's childhood friend, John Fry of Ardent Studios, sent Ardent partner Terry Manning to the Federal Express home office on Democrat Road near the Memphis Airport with the first package to be put into the system. That night, 186 packages were carried. Services included both overnight and two-day package and envelope delivery services, as well as Courier Pak. Federal Express began to market itself as "the freight service company with 550-mile-per-hour delivery trucks". However, the company began to experience financial difficulties, losing up to a million USD a month. While waiting for a flight home to Memphis from Chicago after being turned down for capital by General Dynamics, Smith impulsively hopped a flight to Las Vegas, where he won $27,000 playing blackjack. The winnings enabled the cash-strapped company to meet payroll the following Monday. "The $27,000 wasn’t decisive, but it was an omen that things would get better," Smith says. In the end, he raised somewhere between $50 and $70 million, from twenty of the USA's leading risk venture speculators, including such companies as the First National City Bank of New York and the Bank of America in California. At the time, Federal Express was the most highly financed new company in U.S. history, in terms of venture capital. A 1977 legislative change (Public Law 95-163) removed restrictions on the routes operated by all-cargo airlines, and enabled Federal Express to purchase its first large aircraft: seven Boeing 727-100s. In 1978, the company went public and was listed on The New York Stock Exchange. The following year, it became the first shipping company to use a computer to manage packages when it launched "COSMOS" (Customers, Operations and Services Master Online System), a centralized computer system to manage people, packages, vehicles, and weather scenarios in real time. In 1980, the company implemented "DADS" (Digitally Assisted Dispatch System) to coordinate on-call pickups for customers; this system allows customers to schedule pickups for the same day. In 1980, Federal Express began service to a further 90 cities in the United States. The following year, the company introduced its overnight letter to compete with the U.S. Postal Service's Express Mail, and allowed document shipping for the first time. Later in 1981, it started international operations with service to Canada, and officially opened its "SuperHub" at the Memphis International Airport. Federal Express' sales topped $1 billion for the first time in 1983. In the same, year the company introduced ZapMail, a fax service that guaranteed the delivery of up to five pages in less than two hours for $35. ZapMail would later become a huge failure for the company, costing it hundreds of millions of dollars. In 1994, Federal Express adopted the "FedEx" name, formalizing the abbreviation that until then was unofficial. Also that year, FedEx launched fedex.com as the first transportation web site to offer online package tracking, which allowed customers to conduct business via Internet. In 1995, the company acquired air routes from Evergreen International to start services to China, and opened an Asia and Pacific hub in Subic Bay International Airport in the Philippines. In 1997, FedEx opened its hub at Fort Worth Alliance Airport and, in 1999, opened a European hub at Charles de Gaulle Airport in France. In 2000, the company officially dropped the "Federal Express" name and became "FedEx Express" to distinguish its express shipping service from others offered by its parent company FedEx Corporation. In 2001, FedEx Express signed a 7-year sole source contract to transport all Express Mail and Priority Mail for the United States Postal Service. Prior to 2001, the Postal Service contracted with multiple airlines on a regional basis for these services. This contract allowed FedEx to place drop boxes at every USPS post office. In 2007, the contract was extended until September 2013. In 2013, FedEx Express won a new 7-year contract for the services ending in 2020, beating out UPS which launched a competitive bid. In 2017, the Postal Service extended the 2013 contract to 2024. The USPS continues to be the largest customer of FedEx Express. A DC-10-30F in its first inaugural flight to San Jose International Airport. The late-2000s recession hit parent company FedEx Corporation and its express division hard. Many companies looking for ways to save money stopped shipping or moved to cheaper alternatives, such as surface shipping. FedEx Corporation announced large network capacity reductions at FedEx Express, including retiring some of its oldest and least efficient aircraft such as the McDonnell Douglas DC-10 and the Airbus A310. FedEx also announced layoffs and work hour reductions at some of its hubs. In December 2008, FedEx postponed delivery of the new Boeing 777 Freighter; four were delivered in 2010 as previously agreed, but in 2011, FedEx only took delivery of four, rather than the ten originally planned. The remaining aircraft were delivered in 2012 and 2013. FedEx Express closed a hub for the first time in its history, when operations at its Asian-Pacific hub at Subic Bay International Airport in the Philippines ceased on February 6, 2009. The operations were transferred to Guangzhou Baiyun International Airport in southern China. FedEx Express had planned to open the new Chinese hub in December 2008, but in November 2008, the company delayed the opening until early 2009, citing the need to fully test the new hub. On June 2, 2009, FedEx opened the new hub building at Piedmont Triad International Airport in Greensboro, North Carolina. FedEx announced in December 2008 that it still intended to open the building on time despite the bad economy. The hub's operations would be scaled back from 1,500 employees to only 160, the size of the previous operations at the much smaller sorting facility. FedEx gave no time line as to when the hub would be operating at expected hub levels. The hub had been delayed many years since FedEx first picked the airport to be its Mid-Atlantic U.S. hub back in 1998. FedEx had to fight many complaints from nearby homeowners about the anticipated noise generated by its aircraft, because most of its flights take place at night. A third runway was built to accommodate the hub operation and the extra aircraft. FedEx began full hub operations at the Greensboro facility September 2, 2018. On October 27, 2010, FedEx opened its Central and Eastern European hub at Cologne Bonn Airport. The hub features a fully automated sorting system that can process up to 18,000 packages per hour. The roof of the hub features FedEx's largest solar power installation, producing 800,000 kilowatt hours per year. On December 7, 2018, the company announced the retirement of David Cunningham on December 31, 2018. He will be succeeded as CEO and President by Executive Vice President Rajesh Subramaniam, who has been with FedEx for more than 27 years and has held various executive level positions. Boeing 767-300ERF 71 55 Deliveries through 2023. Boeing 777F 37 21 Additional aircraft to be delivered between 2019 and 2023.
replacing older McDonnell Douglas MD-11F. First Boeing 777F operator in United States. Largest operator of the Boeing 777F. McDonnell Douglas MD-10-10F 18 — To be phased out by 2021. To be replaced by Boeing 767-300ERF and Boeing 777F. McDonnell Douglas MD-11F 56 — Older aircraft to be retired and replaced by Boeing 767-300ERF and Boeing 777F. Note: "SF" stands for Special Freighter aircraft, while "ERF" stands for Extended Range Freighter. FedEx Express operates the world's largest cargo air fleet with more than 650 aircraft, and is the largest operator of the Airbus A300, ATR 42, Cessna 208, McDonnell Douglas DC-10/MD-10, and the McDonnell Douglas MD-11. The company took delivery of the last Boeing 727 built in September 1984 and the last A300/A310 built in July 2007. To be able to respond to changing freight demand quickly (i.e. more cargo that can fit on an aircraft), or to prevent cargo from being stranded on aircraft grounded with mechanical problems, FedEx Express tends to keep a number of empty or underloaded aircraft (usually five) in the air during the overnight to "sweep" the US. In 2007, FedEx revealed plans to acquire 90 Boeing 757-200s. Because production ended in 2005, FedEx was left with no choice but to acquire secondhand aircraft from other airlines to replace its aging Boeing 727 fleet, at a cost of US$2.6 billion. The 757's debut for revenue service was on May 28, 2008. The last Boeing 727 was retired on June 21, 2013, after 35 years of service with FedEx. FedEx Express was scheduled to be the launch airline for the Airbus A380 freighter, having ordered ten for delivery between 2008 and 2011 with options on ten more. The company had planned to introduce the first aircraft into service in August 2008 for use on routes between hubs in the United States and Asia. Faced with A380 delays of more than two years, FedEx canceled these orders and replaced them with an order for 15 Boeing 777Fs with an option for 15 more, to be delivered from 2009 through 2011. FedEx has said that Airbus will allow it to transfer its nonrefundable deposits to purchases of future aircraft, and has stated it may consider the A380F when the A380 program is less affected by construction delays. In December 2008, FedEx postponed delivery of some of the 777s: four were to be delivered in 2010 as previously agreed, and four more in 2011, rather than the 10 originally planned. Delivery of the remaining aircraft was postponed to 2012 and 2013. In January 2009, FedEx exercised its options to buy 15 more 777 freighters and acquired options for a further 15. On December 15, 2011, FedEx announced an order for 27 Boeing 767-300Fs to replace its MD-10 aircraft. The 767s will be delivered between 2014 and 2018, with three aircraft being delivered in 2014, and with six aircraft delivered each year between 2015 and 2018. The airline also delayed deliveries of eleven Boeing 777 freighters currently on order, but converted two options to firm orders. On July 2, 2012, FedEx announced an order for an additional 15 Boeing 767-300 freighters to replace its MD-10 and A310-200 aircraft. As part of this announcement, it converted four of its Boeing 777 freighter order to 767-300Fs, for a total of 19 new 767s. The first Boeing 767-300F was delivered to the airline on September 4, 2013. With one of the world's largest aircraft fleets, FedEx Express is the largest contributor to the United States Civil Reserve Air Fleet in terms of aircraft pledged. The first Dassault Falcon 20C delivered to FedEx (operated with the registration N8FE) is on display at the Steven F. Udvar-Hazy Center of the National Air and Space Museum at the Smithsonian Institution. FedEx Feeder is the branding applied to all FedEx Express propeller-driven aircraft that feed packages to and from airports served by larger jet aircraft. In the United States (along with Morningstar Air Express in Canada), FedEx Express operates FedEx Feeder (and for Morningstar, mainline FedEx service) on a dry lease program where the contractor will lease the aircraft from the FedEx fleet and provide a crew to operate the aircraft solely for FedEx. All of the feeder aircraft operated in the United States, plus the Morningstar feeder and mainline fleet, are owned by FedEx and because of this all of the aircraft are in the FedEx Feeder livery (or in the case of Morningstar's mainline fleet, standard FedEx Express livery). [not in citation given] Just like regional airlines, the contractor operates the aircraft with its own flight number and call sign. Outside the United States (except for Morningstar Air Express), the contractor will supply its own aircraft, which may or may not be in the FedEx Feeder livery. Depending on the arrangement with FedEx, the contractor may be able to carry cargo for other companies with the FedEx cargo. Navistar eStar all-electric van in Los Angeles in 2010. The EV was manufactured in the U.S. under license from Modec. In 2003, FedEx Express introduced hybrid electric/diesel trucks into its fleet. At the time, the company had hoped to replace its entire 30,000 W700 delivery truck fleet with the hybrid, but in June 2009, only 170 were on the road. 93 of these operated in the United States in New York, Tampa, Sacramento, and Washington, D.C.; while the rest operated in Tokyo, Toronto, and Turin. FedEx blamed the low number on a lack of investment from other major companies in hybrid technology. It had hoped that other companies would order hybrid trucks, and that tax credits would be issued by the United States government to reduce the cost. FedEx claimed that the hybrid truck in the 2003 test decreased soot by 96% and emissions by 65%. It also claimed that the truck achieved more than 50% better fuel consumption while still having the same cargo capacity as a conventional truck. In 2009, FedEx Express partnered with Iveco and started a new test program of hybrid electric/diesel vans. The test program consisted of ten hybrid vans deployed in the Italian cities of Milan and Turin. 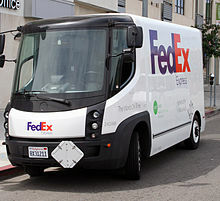 FedEx claimed the new vans would have a 26.5% reduction in fuel consumption and a decrease in carbon dioxide emissions of 7.5 tons when compared to FedEx's standard vehicle. The trial was set to conclude in May 2010 and FedEx would then evaluate if the vans should be deployed on a larger scale. In July 2009, FedEx Express partnered with Freightliner and Eaton Corporation to convert 92 delivery trucks into hybrids. The conversions boosted FedEx's fleet of hybrid-electric vehicles by more than 50 percent to 264. The trucks were placed into service in California, in Los Angeles, San Diego and San Francisco. In November 2009, FedEx Express purchased 51 gasoline-electric hybrid vehicles from Azure Dynamics, to be put into service in The Bronx, New York City. The Bronx became FedEx's first all hybrid station. The addition would bring FedEx Express’ fleet of hybrid electric and electric vehicles to 325. FedEx phased out its last Boeing 727s in 2013 replacing them with Boeing 757s; the airline says the 757s are 47 percent more fuel-efficient. FedEx will eventually switch from MD-11s to Boeing 777s for its long-range, international routes, freeing up the MD-11 fleet to fly shorter routes currently flown by the DC-10. Over the history of Federal Express and FedEx Express, there have been eight incidents in its mainline fleet, plus an attempted hijacking, two deaths and eight aircraft hull losses. This table only lists mainline fleet crashes that happened under FedEx Express' direct operations, and does not list either crashes related to the FedEx Feeder fleet, or incidents or accidents associated with the Flying Tiger Line after its acquisition by Federal Express until its operations were fully merged with Federal Express. 705 1994-04-07 N306FE McDonnell Douglas DC-10-30 4/0 Auburn Calloway, a Federal Express pilot (and former military pilot) facing possible termination for inconsistencies in his claimed prior experience, attempted to hijack the aircraft and crash it. He intended to make the crash appear as an accident in order for his family to receive his Federal Express insurance money. The crew of Flight 705 were able to subdue Calloway and land the aircraft safely. The crew's injuries disabled them from flying professionally ever again. Calloway was eventually sentenced to two life sentences in prison. 1406 1996-09-05 N68055 McDonnell Douglas DC-10-10 5/0 Bound for Logan International Airport, the aircraft experienced an in-flight fire in the cabin cargo compartment, and diverted to Stewart International Airport in Newburgh, New York to make an emergency landing. After landing, the fire consumed the aircraft. 14 1997-07-31 N611FE McDonnell Douglas MD-11 5/0 Arriving at Newark Liberty International Airport from Anchorage International Airport at the end of a scheduled flight, the number 3 (right-side) engine contacted the runway during a rough landing which caused the aircraft to flip over. The crew escaped through a cockpit window before the aircraft was destroyed in the ensuing fire. 87 1999-10-17 N581FE McDonnell Douglas MD-11 2/0 Upon landing at Subic Bay International Airport from Shanghai Hongqiao International Airport, the aircraft overran the whole length of the runway and plunged into the bay where it was completely submerged. It was subsequently written off. 1478 2002-07-26 N497FE Boeing 727-232 3/0 On final approach to Tallahassee Regional Airport from Memphis International Airport, the aircraft's landing gear hit a tree about 70 feet (21 m) high and 3,650 feet (1,110 m) short of the runway which caused it to crash into the trees and open field short of the runway into parked construction vehicles, with it rotated 260 degrees from the runway. The aircraft was destroyed in the ensuing fire. 647 2003-12-18 N364FE McDonnell Douglas MD-10-10 7/0 After landing at Memphis International Airport from Metropolitan Oakland International Airport, the right main landing gear collapsed and caused the aircraft to veer off the runway. The aircraft was destroyed in the subsequent fire. 630 2006-07-28 N391FE McDonnell Douglas MD-10-10 3/0 After landing at Memphis International Airport following a flight from Seattle-Tacoma International Airport, the left main landing gear collapsed. Following the landing gear failure, the number 1 (left-side) engine contacted the runway and caused a small fire and structural damage to the aircraft. The aircraft was written off. (both aircraft) 0/0 These two aircraft were written off after they suffered substantial damage at Piedmont Triad International Airport when the airport was hit by a tornado. Both aircraft were parked when they were struck by the tornado; one aircraft was blown into a ditch and the other was blown into a fence. 80 2009-03-23 N526FE McDonnell Douglas MD-11 2/2 The first fatal accident in the mainline history of FedEx Express, this aircraft suffered multiple bounced landings on its nose before crashing at Narita International Airport while landing in windy conditions. The aircraft touched down and bounced on its nose gear back into the air, coming down again on its nose gear before bouncing back up. The nose gear impacted one final time before the aircraft banked to the left and the wing clipped the ground. The aircraft burst into flames and came to rest upside down, killing both the captain and first officer, the only occupants. 910 2016-10-28 N370FE McDonnell Douglas MD-10-10 2/0 Upon landing on Runway 10L at Fort Lauderdale–Hollywood International Airport, the left engine caught fire on the landing roll. The port side gear then collapsed during the fire approximately 6600 feet down the runway. In 2003 FedEx Express partnered with the Department of Homeland Security and Northrop Grumman to develop and flight test an anti-missile system, the Northrop Grumman Guardian. It is intended that this system could be deployed on commercial airliners to protect them from terrorist attacks such as the 2003 Baghdad DHL attempted shootdown incident. FedEx supplied an MD-11 and a leased 747 for the flight test phase. FedEx Express became the first air carrier to deploy the Guardian on a commercial flight in September, 2006, when it equipped an MD-10 freighter with the pod. The company currently has nine aircraft equipped with the system for further testing and evaluation. Because of the program's success, the U.S. Congress directed DHS to extend it to passenger-carrying aircraft. ^ "Incheon Int'l Airport to open FedEx cargo terminal". TheKoreaHerald. 30 March 2016. Retrieved 30 March 2016. ^ "FedEx Express opens new facility at Shanghai Pudong International Airport". Retrieved 15 April 2018. ^ "FedEx Express to Establish New Singapore Regional Hub". Retrieved 15 April 2018. ^ DVV Media Group GmbH. "FedEx Express opens new Malpensa hub ǀ Air Cargo News". Aircargonews.net. Retrieved 2017-11-11. ^ "Directory: World Airlines". Flight International. April 3, 2007. p. 81. ^ "Welcome to 'the Matrix': At FedEx's sorting hub, 1 night, 1.5M packages". ^ a b c Dallos, Robert E. (April 4, 1980). "Federal Express". Lewiston Morning Tribune. (Idaho). (Los Angeles Times). p. 3D. ^ a b "Online Extra: Fred Smith on the Birth of FedEx". September 19, 2004. Retrieved March 22, 2017. ^ "snopes.com: FedEx Origin". Retrieved February 18, 2014. ^ a b c "Connecting People and Possibilities: The History of FedEx". Retrieved 29 October 2016. ^ a b c d e f g h "History - About FedEx". FedEx. Retrieved March 30, 2015. ^ a b "Fred Smith". Entrepreneur.com. October 9, 2008. Retrieved November 2, 2010. ^ a b c d "FedEx Timeline | About FedEx". FedEx. Archived from the original on February 12, 2012. Retrieved November 2, 2010. ^ "FedEx Corporation – Company History". Fundinguniverse.com. Retrieved November 2, 2010. ^ "Usps News Release: U.S. Postal Service, Fedex Express Agree To New Contract For Air Transportation Of Mail". Usps.com. August 1, 2006. Archived from the original on April 13, 2011. Retrieved November 2, 2010. ^ "FedEx Acquires UK Express Company ANC". FedEx. December 18, 2006. Retrieved February 17, 2007. ^ "About FedEx – Press Releases". FedEx. December 18, 2006. Retrieved November 2, 2010. ^ "FedEx Corp. Reports Third Quarter Earnings | FedEx Global Newsroom". News.van.fedex.com. March 19, 2009. Retrieved November 2, 2010. ^ "Fedex closing hub operations in Subic on Friday – Regions – GMANews.TV – Official Website of GMA News and Public Affairs – Latest Philippine News". GMANews.tv. Retrieved November 2, 2010. ^ "FedEx to maintain standby operations in Subic until April". GMA Network. February 6, 2009. Retrieved February 9, 2009. ^ "FedEx closing hub in Philippines, moving to China". Xinhua. February 7, 2009. Archived from the original on April 26, 2012. Retrieved February 9, 2009. ^ "FedEx Inaugurates New Solar-Powered Hub at Cologne Bonn Airport | FedEx Global Newsroom". News.Van.FedEx.com. Retrieved November 2, 2010. ^ "Raj Subramaniam Named as FedEx Express President and CEO | FedEx Global Newsroom". News.Van.FedEx.com. Retrieved December 19, 2018. ^ "Rajesh Subarmaniam appointed as President and CEO". ^ "FedEx Express Plans to Acquire 50 Additional Boeing 767-300F Aircraft". investors.fedex.com. ^ "Customer Reports - FedEx". Boeing.com. Retrieved 2017-11-11. ^ "Boeing: Commercial". www.boeing.com. Retrieved 2016-05-05. ^ "FedEx Express orders up to 50 new-build ATR freighters". atwonline.com. Retrieved 9 November 2017. ^ "FedEx orders 100 new Cessna 408 SkyCourier freighters". Retrieved 28 November 2017. ^ Gates, Dominic (9 March 2016). "Amazon lines up fleet of Boeing jets to build its own air-cargo network". Seattle Times. ^ "Airbus delivers last A300 to Fedex" (Press release). Airbus.com. July 12, 2007. Archived from the original on August 31, 2007. Retrieved August 3, 2007. ^ "FedEx to spend $2.6 billion to replace its fleet of 727s". OrlandoSentinel.com. September 26, 2006. Archived from the original on October 13, 2007. Retrieved November 2, 2010. ^ with Ben Mutzabaugh (October 13, 2010). "FedEx Cancels Its Airbus A380 Order". Blogs.usatoday.com. Retrieved November 2, 2010. ^ Rigby, Bill (January 12, 2009). "UPDATE 1-FedEx buys more Boeing freighters, defers deliveries". Reuters. ^ Ranson, Lori (15 December 2011). "FedEx signs on for 27 767-300Fs". Flightglobal. Retrieved 16 December 2011. ^ "Boeing, FedEx Announce Order for 767 and 777 Freighters" (Press release). Boeing. 15 December 2011. Retrieved 16 December 2011. ^ "FedEx Express to grow fleet with 767-300s". July 2, 2012. Archived from the original on August 29, 2013. ^ "FedEx Express receives first 767-300 freighter". Air Cargo World. September 4, 2013. Archived from the original on September 7, 2013. Retrieved September 10, 2013. ^ a b "End of an Era as FedEx Express Retires Last B727". About FedEx. Retrieved 2018-04-03. ^ a b "French Falcon Gave FedEx its Wings" (PDF). ^ "Baron Aviation". Baron Aviation. Retrieved November 2, 2010. ^ "Aircraft Contract Services". Air Contractors. Archived from the original on September 14, 2010. Retrieved November 2, 2010. ^ Zach McDonald (2010). "First Navistar Electric Trucks Are Deployed, With 400 More Coming This Year". PluginCars.com. Retrieved 2012-10-01. ^ a b "News Item: FedEx Express and Iveco Present First Test Results For Hybrid-Electric Vans | FedEx Citizenship Blog". 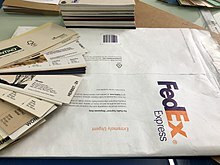 Citizenshipblog.fedex.designcdt.com. April 6, 2009. Retrieved November 2, 2010. ^ a b Nastu, Paul (22 February 2007). "FedEx Adds Electric Hybrids to Denver Fleet". ^ "FedEx Hybrid Truck Plan Hits Speed Bump". Environmentalleader.com. October 2, 2008. Retrieved November 2, 2010. ^ Charlotte Business Journal (July 21, 2009). "Charlotte project converts FedEx trucks to hybrids". Bizjournals.com. Retrieved November 2, 2010. ^ "FedEx Further Expands its Environmentally Friendly Vehicle Fleet With Order of 51 New Azure Dynamics Hybrid Electric Delivery Vans" (Press release). fedex.com. November 9, 2009. Retrieved November 2, 2010. ^ a b Burnham, Michael (July 7, 2009). "UPS Vows to Slash Air Fleet's Fuel Use, Emissions". The New York Times. Retrieved May 2, 2010. ^ "FAA Registry (N306FE)". Federal Aviation Administration. ^ "ASN Aircraft accident description (FedEx Flight 705)". Aviation-safety.net. Retrieved November 2, 2010. ^ "FAA Registry (N68055)". Federal Aviation Administration. ^ "ASN Aircraft accident description (FedEx Flight 1406)". Aviation-safety.net. Retrieved September 7, 2014. ^ "Aircraft Accident Report - In-Flight Fire/Emergency Landing Federal Express Flight 1406 Douglas DC-10-10, N68055". National Transportation Safety Board. July 22, 1998. Retrieved September 7, 2014. ^ "FAA Registry (N611FE)". Federal Aviation Administration. ^ "ASN Aircraft accident description (FedEx Express Flight 14)". Aviation-safety.net. Retrieved November 2, 2010. ^ "FAA Registry (N581FE)". Federal Aviation Administration. ^ "ASN Aircraft accident description (FedEx Express Flight 87)". Aviation-safety.net. October 17, 1999. Retrieved November 2, 2010. ^ "FAA Registry (N497FE)". Federal Aviation Administration. ^ "ASN Aircraft accident description (FedEx Express Flight 1478)". Aviation-safety.net. Retrieved September 7, 2014. ^ "Accident Photo: FedEx Flight 1478 (2)". AirDisaster.Com. July 26, 2002. Archived from the original on September 15, 2010. Retrieved November 2, 2010. ^ "FAA Registry (N364FE)". Federal Aviation Administration. ^ "Hard Landing, Gear Collapse, Federal Express Flight 647, Boeing MD-10-10F, N364FE, Memphis, Tennessee, December 18, 2003" (PDF). National Transportation Safety Board. Retrieved September 7, 2014. ^ "FAA Registry (N391FE)". Federal Aviation Administration. ^ "ASN Aircraft accident description (FedEx Express Flight 647)". Aviation-safety.net. Retrieved November 2, 2010. ^ "FAA Registry (N904FX)". Federal Aviation Administration. ^ "FAA Registry (N905FX)". Federal Aviation Administration. ^ "Aviation Safety Network > ASN Aviation Safety Database > Operator index > United States of America > FedEx". Aviation-safety.net. November 28, 2004. Retrieved November 2, 2010. ^ "FAA Registry (N526FE)". Federal Aviation Administration. ^ "Cargo plane crash lands in Japan". BBC News. March 23, 2009. Retrieved November 2, 2010. ^ "FAA Registry (N370FE)". Federal Aviation Administration. ^ "Accident: Fedex MD10 at Fort Lauderdale on Oct 28th 2016, main gear collapse on landing, aircraft on fire". AVHerald. October 28, 2016. Retrieved October 29, 2016. ^ Doyle, John M. (September 17, 2006). "FedEx To Fly Counter Manpads-Equipped MD-10". Aviation Week & Space Technology. Retrieved October 29, 2007. Note that only the first of two pages has been preserved in the archive.org record. ^ Terdiman, Daniel. "Welcome to 'the Matrix': At FedEx's sorting hub, 1 night, 1.5M packages". Cnet. Retrieved 15 March 2016. ^ Mann Jr., Joseph A. "FedEx Express has Miami hub, Americas reach". Miami Herald. Retrieved 15 March 2016. ^ "FedEx Express opens mammoth Shanghai hub, touts improved Asia linkage". Retrieved 15 April 2018. ^ "FedEx Express opens hub facilities in Japan and Mexico". Post & Parcel. Retrieved 15 March 2016. ^ "FedEx Opens New Facility In Abu Dhabi's Airport". Gulf Business. Retrieved 15 March 2016. Wikimedia Commons has media related to FedEx Express.